Tara Mactaggart (Minto), pictured, has won the Border women's county championship for the fourth year in a row. 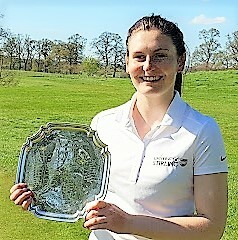 In Sunday's final at The Roxburghe she beat Julie Birdsall 4 and 3. The bronze championship was won by Olivia O'Leary with 38 Stableford points. T Mactaggart bt C Howden 7 and 5. G Lithgow bt C Purves 3 and 1. Mactaggart bt Pow 2 and 1. Paterson bt Lithgow 5 and 4. Wilson bt Cuthbertson 4 and 3. Mactaggart bt Paterson 6 and 5. Birdsall bt Wilson 4 and 3. Mactaggart bt Birdsall 4 and 3.